One of the most gratifying aspects of living in San Miguel is the ability to interact with, and indeed, influence the lives of others. What started as a simple outing with our housekeeper's 9 1/2 year old son Erik has turned into a long term project - teaching him photography and enhancing his self-esteem. When I gave Erik an old digital camera a couple of months ago, I had no idea that he would develop a passion for photography and would display some real talent. With each lesson, he is more outgoing and enthusiastic. Recently, Linda and I showed some of his work to friends. 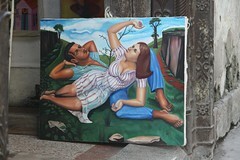 The response was so positive that we have decided to give him an exhibit at our home in San Miguel. At the show, Erik's photos will be sold for 100 pesos each (about $8 US). The proceeds will be used to help Erik purchase a new camera in order to pursue his passion for photography. Rather than simply giving him a new camera, we thought it would be important for him to contribute to the purchase. 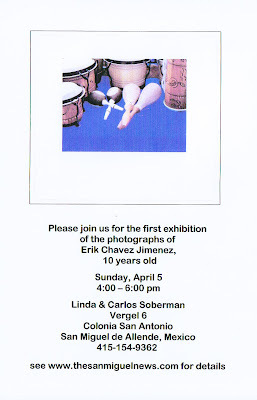 Come and meet Erik and his family next Sunday, April 5, from 4-6PM at our home on Vergel 6, San Antonio. Drinks and appetizers will be served. For those of you that are unable to come to the exhibition, you may view Erik's work on this blog and contact Linda or me if you would like to purchases any of Erik's photographs. Please see the above invitation for details about the event next Sunday, April 5.